Held in the mild and refreshing days of early Spring, the Ridgeland Fine Arts Festival presents artists and their work against the splendid setting of Renaissance at Colony Park, a regional lifestyle center renowned for its shopping, dining and entertainment as well as for its graceful Old World architecture inspired by the cities of Europe and the Mediterranean. capital, to a vibrant hub for the arts and a premier retail and dining venue. campaign. All proceeds are used to produce and promote the show. conjunction with the Ridgeland Fine Arts Festival. The timing of our show works well for routing with some of the spring Texas shows and events in Atlanta and New Orleans. 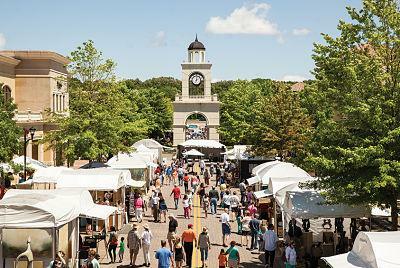 The Ridgeland Fine Arts Festival was recently named the "Top 20 Events Champion" by the Southeast Tourism Society. Recognized by AAA's Southern Traveler as a Southern Travel Treasure. Hyatt Place Jackson/Ridgeland is adjacent to the festival site and offers special show rates for artists. The Ridgeland Fine Arts Festival is presented by the Ridgeland Tourism Commission who develops and implements a robust regional marketing campaign. All proceeds are used to produce and promote the show.